Memoir is my new favorite genre. Memoirs give us stories with characters, plot, and dialogue, but the twist is that the characters are real people. We could go to a book signing or author event and actually meet them if we wanted to. And the events in memoirs, though dialogue and events may not play out exactly as they happened, really occurred. Memoirs give us a front row view into someone else's real life and emotions. Memoir writers are like good friends whispering their secrets in our ears. Memoirs make heroes out of normal, everyday people who fight the same battles we ourselves fight every day. They make us believe we can be heroes, too. I loved Aaron Hartzler's memoir and recommend it for all libraries serving teens. SUMMARY: When he was four, Aaron Hartzler couldn't wait until the Rapture, the moment Jesus came down from heaven and whisked he and his family back to heaven with him. But that never happened. By age 16, Aaron questioned everything: his faith, his parents' rules, and his sexuality. 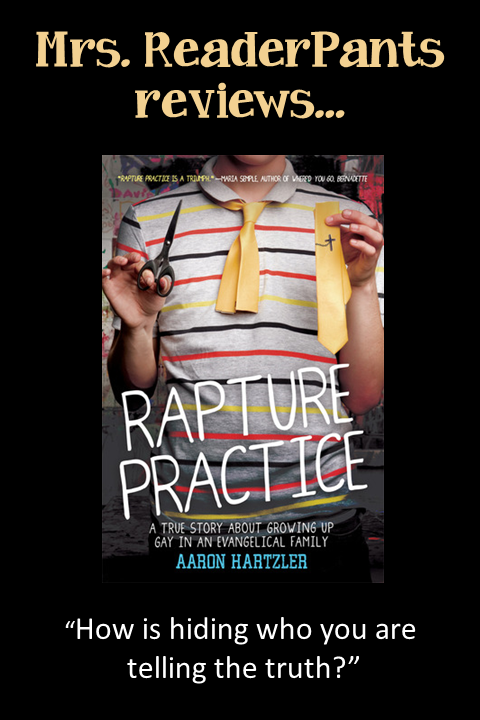 REVIEW: Aaron Hartzler and I are the same age, which makes me about 25 years past the target audience for Rapture Practice, but I thoroughly enjoyed and connected with Aaron's story anyway. Aaron's struggles are real, as are his parents, siblings, friends, teachers, principal, and classmates. The book is easy to get into and well-paced. I really felt Aaron's inner conflicts, particularly how he seems to love and hate his parents at the same time. Aaron says at the end that he doesn't know if his parents have read his book. I hope they have read it, and I hope it made them take a good hard look at how they abused Aaron. Aaron never uses the word "abuse," but I will. They made him believe if he didn't follow their insane rules, he would go to hell. Later, when he decided he wouldn't go to hell if he saw a movie or drank a beer, his parents controlled him with "disappointment," extreme guilt, public humiliation, and a couple of times, violence. That spanking thing was especially weird; my jaw dropped a bit when I read that part. So yes, I hope they read the book and that their treatment of Aaron haunts them every day. You can be nice and funny and a pillar of the community and still be abusive. I do believe they truly love Aaron and are doing what they think is best, but they are seriously warped and deserved to be called out on it. This book is crazy-important for all high school libraries. I am a high school librarian, and I can think of several students I would hand this book to. I also know students who have already graduated who I hope are able to find this book on their own. Sure, there could be push-back from more conservative communities about Rapture Practice being on library shelves, but isn't that just the point? Aaron says he wrote this book specifically for teens like himself, who are confused and conflicted about what their parents expect and being who they truly are. THE BOTTOM LINE: Librarians and teachers, please buy this for your students. Some readers, like me, will read it and have a greater understanding of what it means to live an honest life despite your environment and the people who try to control your choices. Some readers will find Aaron's story mirrors their own struggles. There are teens who truly need this book. They are why Aaron wrote it. Please give teens the opportunity to find it. STATUS IN MY LIBRARY: On order. I booktalked it with a class of ninth graders, and I already have a girl who has requested she gets it first.